Austrian-born, Swiss theoretical physicist; winner of the 1945 Nobel Prize in Physics. ALS. (“W. Pauli”). N.p. 2pp. 4to. 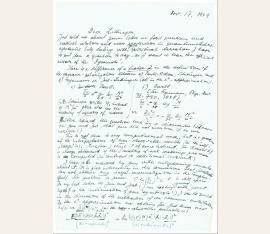 To the eminent American physicist JOAQUIN M. LUTTINGER (1923-1997). 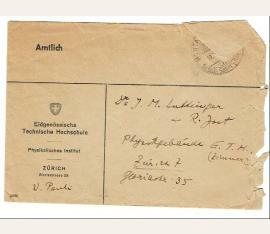 “Dear Luttinger, Jost told me about your letter on food questions and radical solutions and mass [?] production in quantum electrodynamics. Only dealing with your spiritual starvation I have to put you a question today, as I want to hear the official answer of the ‘Dysonists’ [likely a reference to Freeman Dyson]: There is a difference of a factor… in the definition of the vacuum-polarization … a) Pauli-Villars … and b) Feynmann or Jost-Luttinger (all in the e2-approximation). [There follow formulas for a) and b) plus an additional explanation] Neither raised this question here in a discussion (shame on you and Jost, that you did not mention it to me earlier!) This is not due to any computational error, but it is a question of the interpretation of non-observable results (as the self …). Therefore I think it of some interest. The result b) is always obtained if the S-matrix of real scattering process is computed (in contrast to additional currents). I hope to be received by you with enlightening remarks about it. (It is also interesting in this connection that Shafroth does not obtain any charge-renormalization in the Compton-effect). The problem to prove [formula] is still open. In my last letter to you and Jost (I am looking forward with great hopes to the continuation of your ‘symbiosis’) I was to[o] quick in the discussion of the subtraction of the vacuum contribution in the e2-approximation one obtains for god knows now [?] [formulas plus Luttinger’s annotations] Shafroth proved (with help of formulas contained in his doctor-thesis) that the numerators are equal, so that one can immediately … the result is negative. But it was not possible for us to guess the correct generalization of this to higher approximations in [Greek symbol]. Jost wants to resume this problem when he arrives in December. I leave on Tuesday and will arrive according to schedule on November 29th in New York with Mrs. Pauli. It was great fun to telephone with Oppe [J. Robert Oppenheimer?]. His voice sounded as if he had lost a couple of bets. (As the Washington administration made me miss the boat on Nov. 10th). 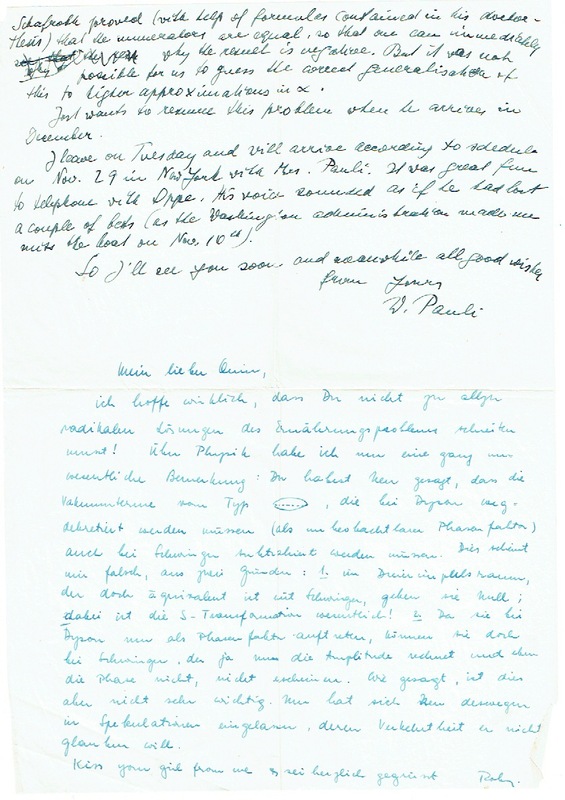 So I’ll see you soon and meanwhile all good wishes From Yours W. Pauli [There follows a 17-line note in German signed Roby(? 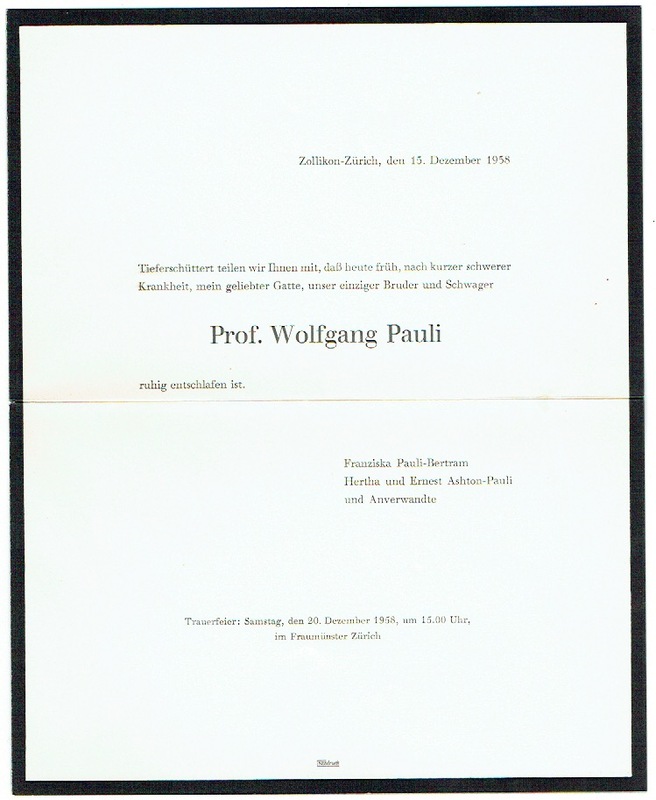 )]” The author of a classic text on relativity theory, Pauli received his doctorate in 1922. 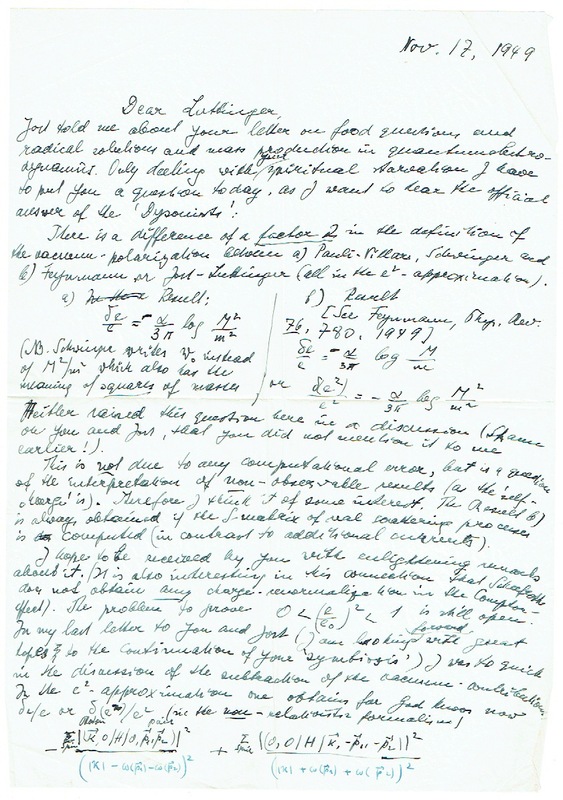 He soon began work on the Zeeman effect, and within two years had both proposed a new quantum number for electrons and formulated his now-famous “exclusion principle... the crowning conclusion to the old quantum theory,” also known as the Pauli Principle, and for which he was awarded the 1945 Nobel Prize in Physics, after being nominated by Albert Einstein, (DSB). Pauli’s contributions to quantum physics are difficult to overstate. He postulated the existence of the neutrino, formulated the Pauli matrices and proposed spin theory, one of two forms of angular momentum of elementary particles. Pauli is well known for postulating many of his ideas in letters rather than in published academic works, being unconcerned with getting credit for his theories. He was also known as the “conscience of physics,” holding his colleagues and their ideas morally and ethically accountable. After earning his PhD in physics from MIT in 1947, Luttinger was awarded a National Research Council Fellowship for 1948-1949. 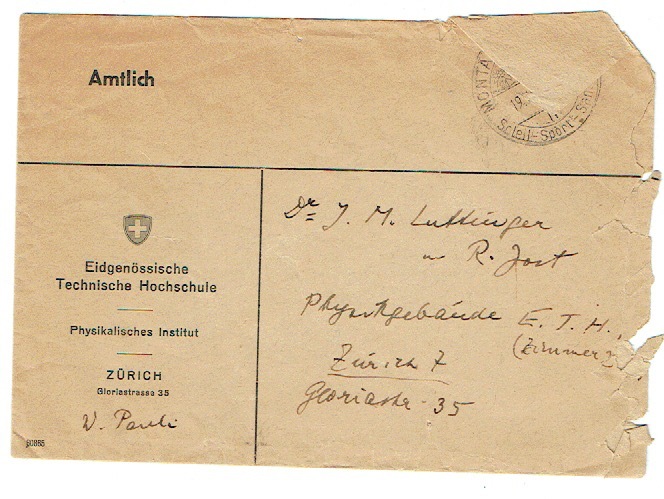 As such “Luttinger took advantage of a Swiss-American exchange fellowship to become the first American postdoc in Wolfgang Pauli’s group at the Swiss Federal Institute of Technology in Zurich after World War II. There, he demonstrated his brilliance in contributions… to the just-developed renormalized quantum electrodynamics. Especially noteworthy is his 1948 calculation of the anomalous magnetic moment of the electron, carried out independently of and approximately simultaneously with the calculation by Julian Schwinger,” (Joaquin M. Luttinger’s obituary in Journal of Statistical Physics). Among his many innovative theories is the Luttinger liquid model, which describes the interaction of electrons in a one-dimensional conductor. He is also known for Luttinger’s theorem, the Luttinger parameter and the Luttinger-Ward function. Over the course of his illustrious career, he was affiliated with Princeton’s Institute for Advanced Study and was a physics professor at the University of Wisconsin, University of Michigan, University of Pennsylvania, Columbia University, and Rockefeller University..
Physiker und Nobelpreisträger (1900-1958). Eigenh. Briefumschlag mit Absenderangabe „W. Pauli“. Montana-Vermala. Quer-8vo. Der Briefumschlag ist gerichtet an den amerikanischen Physiker Joaquin M. Luttinger(1923-1997), damals tätig an der E.T.H. in Zürich. - Beiliegt: Todesanzeige Paulis mit Briefumschlag.